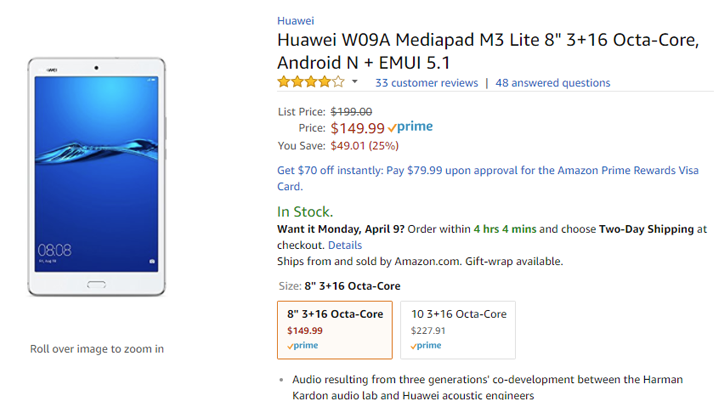 In August of last year, Huawei released four new MediaPad tablets, including the M3 Lite 8". It was already a good device when it was $200, but now it's on sale again. The tablet is currently $149.99 from Amazon and Newegg, a $50 reduction from the MSRP. The M3 Lite has a Qualcomm Snapdragon 430 processor, 16GB of storage with microSD expansion, 3GB of RAM, dual speakers, and a 1920x1200 display. That's not bad at all for a tablet this cheap, and the 4,800mAh battery should last a day or two of regular use. As for software, the M3 Lite has Android 7.0 Nougat with EMUI 5.1. You can buy the tablet from the links below. Newegg's sale ends in six days, and Amazon's will likely last the same amount of time.